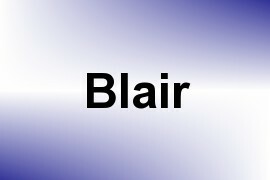 The name Blair is of English origin, and means flat piece of property. The table below indicates the number of times the name Blair has been given to baby boys in recent years. The last 125 years refers to 1880 through 2004; last year refers to 2004. The rank and count values are based on U.S. Social Security Administration counts for the one thousand most popular names given to baby boys in each of these years. The table below indicates the number of times the name Blair has been given to baby boys and baby girls each year, from 1880 through 2004. Blair first appeared in the top thousand boy or girl names during 1881, which is the first year shown on the table. Blair last appeared in either or both of these name lists during 2000, the last year shown on the table. A blank entry indicates that the name did not rank among the top one thousand names given to boys or girls, respectively, during the specified year. During the last 125 years, parents have used Blair as a boy's name about 60% of the time and as a girl's name about 39% of the time. This name has been considered suitable for either boys or girls. Cumulative counts and total counts shown on the above tables are slightly lower than actual counts because the name Blair appears in the top 1,000 boy names only 104 times during the last 125 years.